A DUP councillor who claimed she had been "bullied" by the party has resigned ahead of an internal disciplinary inquiry. Jenny Palmer told the BBC NI Spotlight programme: "I certainly won't hang around for them to discipline me for telling the truth." Her husband, John, who is also a Lisburn councillor, is quitting the party. Her entire family is leaving the DUP. In July 2013, Mrs Palmer told Spotlight that she had been ordered by a DUP special adviser, Stephen Brimstone, to change the way she intended to vote at a Housing Executive board meeting called to terminate a contract with the maintenance firm, Red Sky. 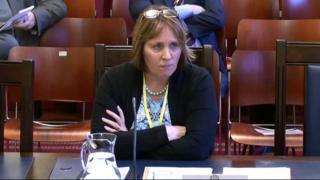 The social development committee at Stormont launched an inquiry that was told by Mrs Palmer that she had rejected five draft apologies from Mr Brimstone and DUP leader Peter Robinson. But she clashed with DUP committee member Sammy Wilson who accused her of changing her story. Recently, it emerged that she was to face a DUP disciplinary panel accused of bringing the party into disrepute. Now she has told BBC Spotlight reporter Mandy McAuley: "My family are resigning. My mother is resigning…from the party because of the behaviour within the party that hold the power within Northern Ireland. "And it's a difficult letter to write and I have said in it, it's with a heavy heart that I felt it necessary to tender my resignation, but I certainly won't hang around for them to discipline me for telling the truth. "John and I have talked with the children and we've talked with each other and we are all of the opinion that we've been treated very badly. I knew that I had to complete the journey. "The party has been good to us, the party is a good party and it works really, really well." Asked if she really believes that the DUP is a good party she said: "Yes. I do, and it's individuals within this party that are bringing this party down." Her husband, John Palmer, said: "There's people within the party that want to search their conscience, you know." Last week, the Stormont inquiry found that the then social development minister, Nelson McCausland, had acted inappropriately. Stephen Brimstone, meanwhile, has been promoted to work as a special adviser alongside Peter Robinson in the office of the first and deputy first minister.